Terms like “low-functioning” are short on nuance and long on stigma. It’s clear that Alex and John each function well in certain areas of life and struggle in others; each has an idiosyncratic patchwork of skills and challenges. Their stories illustrate a problem that has plagued autism research for decades: What, exactly, do the terms high- and low-functioning mean and to whom do they apply? An ongoing study in Canada may be able to help answer this question. Since 2004, a team of researchers at five universities has been tracking more than 400 children with autism, including Alex and John, since they received their autism diagnoses. They are characterizing the children by their developmental trajectories—how their symptoms and abilities in multiple domains change over years and even decades. The long-term study may help explain why these two children diverged in their skills despite starting out with similar ones at the time of diagnosis. It may also explain how the traditional labels need to evolve to accurately describe children with autism. Other teams are developing multidimensional techniques for measuring how well a person with autism functions in different aspects of daily life—from communicating with others to the ability to participate in a community. These new tools may provide a common language, so that researchers, clinicians and families can more easily understand one another. They may point the way toward personalized treatment by pinpointing individual deficits. But beyond those practical goals, they may also provide a dramatically richer, more holistic sense of what it is like to be a person with autism. In studies of autism, the term ‘high-functioning’ is often used to describe a person with autism who scores above 70 or 80 on intelligence quotient (IQ) tests. Scientists sometimes exclude those who score below this cutoff from their autism research because the participants may have difficulty following instructions or completing the study. Some researchers instead use symptom severity as a metric: For example, they might label as low-functioning a child who frequently avoids interacting with others and flaps his hands a lot or shows other repetitive behaviors and restricted interests. In practical terms, either label can be limiting: It might prevent one child from participating in activities she wants to do, or exclude another from getting the services he needs. Szatmari’s study may provide some alternatives. The idea for the study germinated in the 1990s, long before Alex and John were even born. Szatmari and his colleagues wanted to design and conduct a study that would address the research priority of the broader autism community, which includes parents, clinicians and policymakers. They surveyed the community to assess priorities, and the most popular suggestion came as a surprise. What determines how well a person with autism will function in life? “I thought it would be a study on what’s the most effective form of early intervention, or what’s the best treatment,” Szatmari says. Instead, the question that came up most frequently was: ‘What factors are associated with a good outcome?’ In other words, what determines how well a person with autism will function in life? To answer the question, Szatmari and his team launched the Pathways in Autism Spectrum Disorders study to track children diagnosed with autism between the ages of 2 and 4. Because few researchers agree on what a good outcome looks likein people with autism, the team decided at the outset not to focus on any single domain, instead tracking the children in a variety of areas. Four times during the first four years and roughly every two years thereafter, the researchers have measured the children’s cognitive abilities, language skills, andseverity of autism symptoms with standardized tests. Parents and caregivers complete questionnaires that ask about their own stress levels and coping methods and their child’s daily living skills, behaviors, symptoms and treatments. One goal of the study is simply to describe how the children’s symptoms, skills and abilities change as they grow up, and to determine whether they fall into subgroups based on these trajectories. Another aim is to figure out whether certain characteristics at baseline—such as IQ score, language ability, gender, or age at diagnosis—can predict how a child will change over time. Already, the initial phase of the study has brought new insights about how symptom severity and daily living skills may change in the children from the time of diagnosis up to age 6. (The second phase, for which the researchers finished collecting data last year, looks at how the children functioned up until 11 to 12 years of age; a third phase aims to follow the children until they are 18.) After analyzing four years’ worth of data, Szatmari and his colleagues reported last year that they could divide the children into two groups based on the severity of their symptoms, including social and communicative impairments, repetitive behaviors, and restricted interests. Most of the children had severe symptoms at the time of diagnosis and changed little as they grew up. A smaller group, 11 percent, began with relatively mild autism symptoms that improved over time. Next, the team looked at skills of daily living, also known as adaptive functioning—how well the children communicate and interact, whether they can make a phone call or use the Internet, their ability to eat, dress, bathe, and brush their teeth, and how well they understand concepts such as time and money. One group, including 29 percent of the children, had the poorest daily living skills, which worsened with time. A second group—half of the children—had moderate functioning levels that remained stable. The third and smallest group of the children had the strongest abilities at diagnosis and improved with age. Surprisingly, the researchers found little overlap between the two sets of groups. The children with the most severe symptoms did not necessarily belong to the group with the poorest daily living skills, suggesting that symptom severity has little to do with performing everyday tasks. Some children with autism, like Alex, might have narrow interests and struggle to talk, but they still manage to take care of daily tasks. This finding reflects what parents often report: Some children with autism, like Alex, might have narrow interests and struggle to talk, but they still manage to take care of daily tasks. It also reaffirms that one single measure of functioning cannot predict how well a child performs in other areas. In any case, by demonstrating the inherently dynamic nature of autism, Szatmari’s findings point to the weakness in using the same label to describe a child throughout her life. Most studies that brand children with autism as high- or low-functioning do so based on IQ as measured at a single point in time. But “kids can change with respect to their baseline, and they can also even change in terms of how they compare to other kids,” says Lonnie Zwaigenbaum, the co-director of the Autism Research Center at the University of Alberta, who works with Szatmari on the study. Because of this, it may be inappropriate to judge the functioning level of a child with autism based on a single measure early in childhood. With data from only the first phase of the study analyzed, it’s too soon to say which factors in early childhood predict how a child will fare over time. So far, the researchers have reported that the boys in the group tend to have stable autism symptoms throughout childhood, whereas the girls tend to start out with mild symptoms and improve with age. What’s more, the children who were diagnosed early or who had a high baseline IQ or good early language skills seem to also have good daily living skills that improve over time. In Alex’s case, for example, her communication and social skills have improved dramatically over the past three years, says Wendy, her mother. Alex’s parents are growing more confident in her ability to fend for herself around the home, too. Alex still needs help bathing and using the bathroom, but she has few difficulties picking out and putting on her clothes, brushing her teeth, putting herself to bed and feeding herself prepared foods. One night in February, for example, Wendy put a plate of chocolate chip cookies on the table, and Alex immediately bounded over to investigate. She held a cookie to her nose and inhaled deeply. A look of disgust flashed across her round face, and she dropped the cookie back onto the plate, spun around, and strode out of the room. She began rummaging around in the freezer, then returned to the dining room carefully tearing off the wrapper of an ice cream sandwich. It seemed pretty clear that she knew it was time for family dessert and had figured out a way to participate even though she didn’t want what everyone else was having. 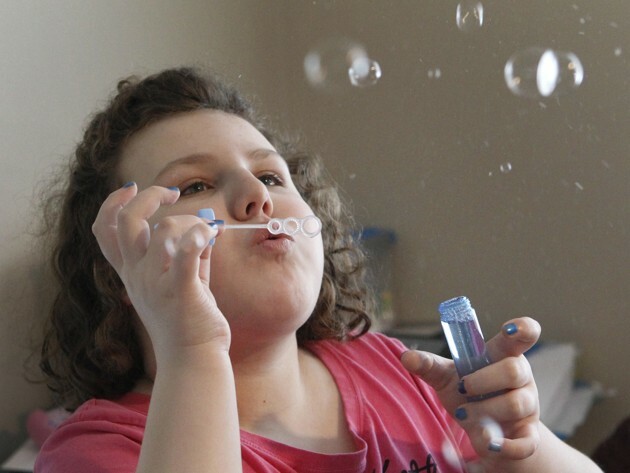 Alex’s parents worry that her ‘low-functioning’ label might be hindering her development. Still, Alex’s parents worry that her ‘low-functioning’ label might be hindering her development. Alex enjoys swimming, for example, but her parents say they have seen advertisements for swim lessons that can accommodate only high-functioning children with autism. So far, the researchers have focused on abilities they can quantify: symptom severity, IQ, skills and behaviors. Elsabbagh has plans to explore more intangible measures. ASD Voices, a subproject of Pathways, aims to collect the children’s first-person perspectives on their hopes and dreams, interests, feelings and thoughts. The details are being worked out, but the team plans to interview those children who can communicate in words and, for those who cannot, offer alternative modes of expression such as drawing and photography. The researchers’ goal is to learn what each child considers to be a ‘good outcome’ and compare that with the types of outcomes studies traditionally measure. The people best able to describe what a good outcome looks like would be the kids themselves, Elsabbagh says. Other teams are also exploring methods to probe functioning beyond binary high/low measurements. For example, researchers at the Karolinska Institute in Sweden are developing a standardized test to capture a comprehensive profile of functioning in children with autism. The team’s work draws on the International Classification of Functioning, Disability and Health (ICF), a massive tool developed by the World Health Organization to assess how any health condition affects daily functioning. The ICF measures people on a scale from 0 to 9 for more than 1,400 items spanning how severely a health condition affects their body and their ability to fulfill everyday activities, as well as how environmental factors — such as relationships and access to support services — improve or worsen their daily life. Disability Support Pension - are autistic people eligible?